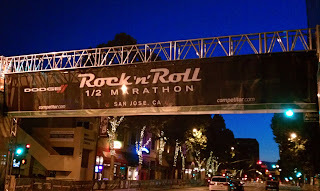 At the San Jose Rock 'n' Roll Half Marathon, I took a break from running and went behind the scenes as a volunteer. What a great experience - I loved the insight into set up and race organization. Plus, Kev was running so it was nice to be involved and to meet him at the end. Here are a few of my observations in detail. Volunteer Check-In: I woke up at 5 am and got to the start around 6 am...so early and still dark. Arriving at the volunteer check-in tent was odd; the area was full of high school age kids and only a couple of people my age or older. It turns out the high schools here have volunteer hour requirements and races are a popular choice. This is so different from where I grew up, but I think it's super cool to expose students to endurance running at a young age. Start Corrals: My task was helping out in the start corrals. They asked us to get in groups of 3 (I found two other non-high schoolers to group up with) and had us gather in for instructions. It was pretty simple - we'd be separating the corrals, two people to hold a rope and one to hold the numbered sign. I took the sign and head to the front of my corral. 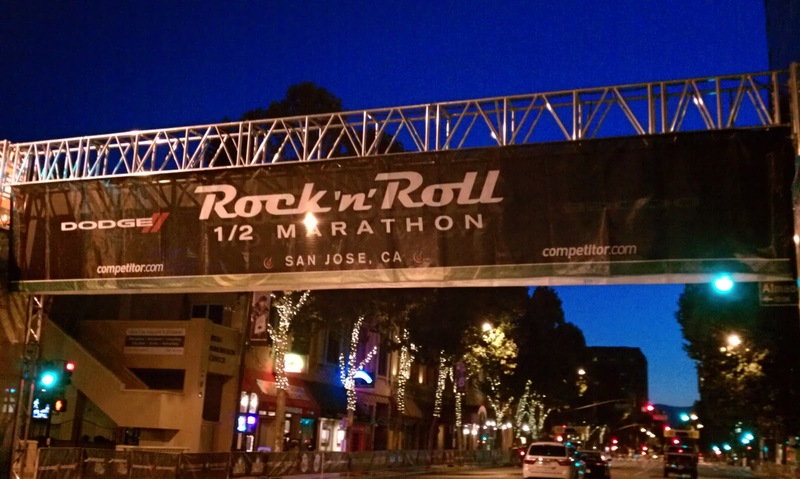 While waiting, I talked to runners about the race, other races, and why they were running. The energy was high and I was totally caught up in the excitement as if I were running myself. Before the start, we moved the ropes and got out of the way, and on the runners went. The runners would be coming back that direction at mile 4.5, so we quickly cleaned up the bottles and any tripping hazards, and moved the barricades to keep spectators out of the road. Before we knew it...the runners were coming back through lead by Meb on pace for about a one hour finish. Down time: I went back to the finish area to get a new task, and the race director told me they were all set. I was pretty bummed because I wanted to continue helping, but I took a break to grab a coffee and to watch Kev come through the 4 mile mark. I cheered him on and headed back to the finish area, where I went through the finish chute barricades (good to be wearing a volunteer shirt) and found a group that took me in for handing out medals. Finish: The finish line was an exciting place to be. I watched the team get ready for the winner, setting up and practicing with the tape. Soon after, the lead car and press cars came through the finish. 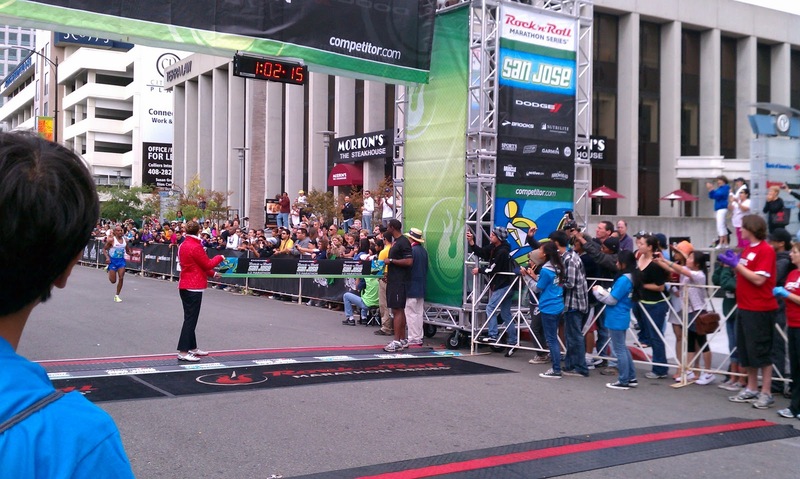 Around 62 minutes, Meb came racing through the tape to win the San Jose Rock 'n' Roll Half Marathon! 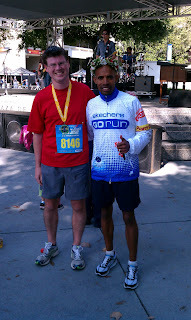 He was a great guy, hanging around the finish to shake hands, take pictures, and give high fives. I got to shake his hand too! A few more men came through, and then Deena Kastor finished first for the women. She, too, was friendly and hung around to chat with people. After: Kev finished with a PR of 1:50:23, and I was there to put his medal around his neck. The post-race highlight (aside from free beer) - Kev met Meb and I took a picture of them together. What a great finish to a great event! 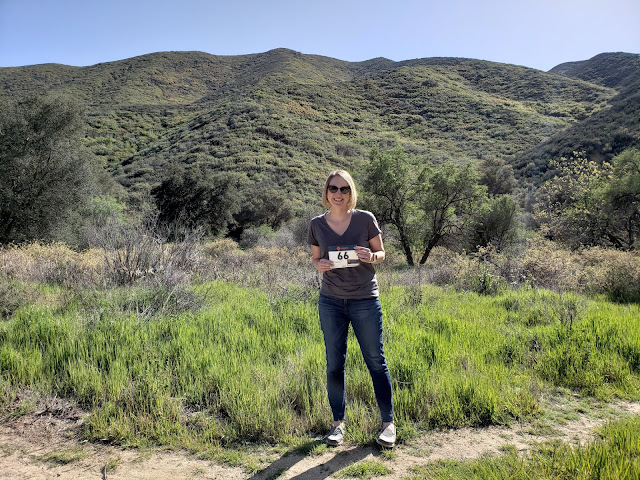 Overall Outlook: Volunteering was super fun, and with so many races here in California I plan to volunteer for races that I can't run. I like giving back after being on the taking end for so long. 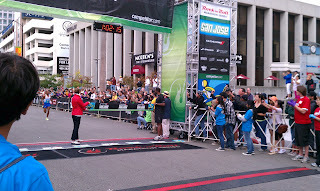 The energy was catching and I enjoyed seeing the winners finish and handing out medals. The only disappointing part was that some of the fast finishers (elites perhaps) turned down medals and didn't have good attitudes at the finish. I'm sure they have tons of medals and were sad to lose the race, but they are still looked up to by so many people and could have given the high school student volunteers a better face. 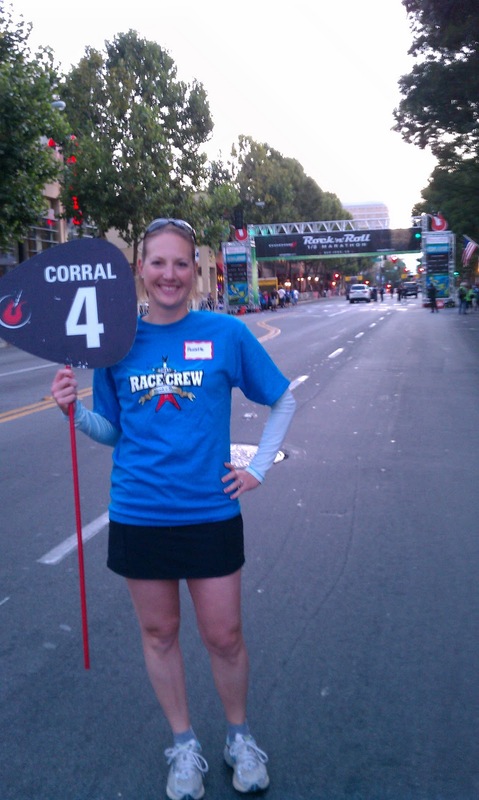 If you have ever considered volunteering for a race - try it out. You'll be glad you did.